Do you want to share photos on your Apple iPad via email? 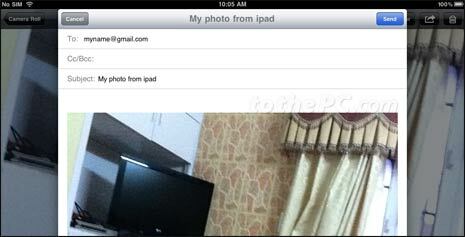 You can easily select and send multiple photos from iPad to any email address. 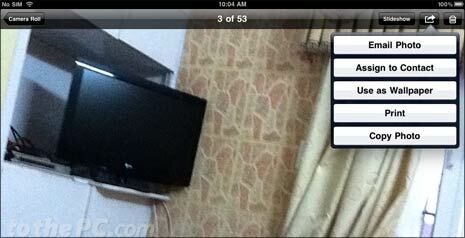 There is no need to download or install any special app for emailing photos on iPad. You can simply use inbuilt functionality on iPad to quickly send email with photo attachments to any email ID address of your choice. 1. On your iPad home screen, tap on Photos icon (present on the dock). This will show photo albums on the iPad. Tap on photo album icon to view photos contained in the album. 2. If you want to send single photo, tap to open the photo. Then tap again to view top actions bar and tap right arrow at top right side. 3. Then tap on ‘Email photo’ option, this will open ‘New Message’ window. Add email ID to whom you want to send email message with photo attached. Enter subject line title for the email and tap Send button. iPad will send email with your attached photo to specified email address. If you want to email multiple photos attached in single email message – tap to open photo album. Then tap right arrow at top right part of iPad screen. Now tap to select photos that you want to send in single email message. Them tap email button at top left side to open ‘New Message’ window with selected photos attached. Enter email ID, subject or title for the email and tap send button for sending email with multiple photos as attachment.